From the humble, coloured hard-boiled egg to the most prestigious Fabergé eggs in precious metals and decorated stones, the Easter egg is an age-old tradition. In fact, the custom of offering decorated eggs existed long before the Christian era. As spring is the season in which nature blossoms, the egg, representing life and rebirth, was probably the first symbol of fertility used in rituals dating from the dawn of time. 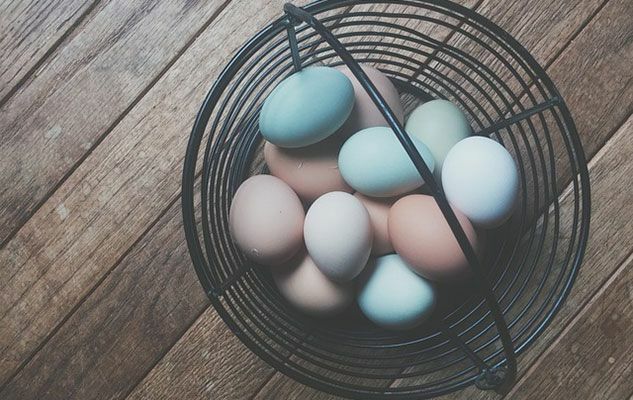 Since eating eggs during Lent was forbidden in Christianity, the eggs laid by hens during this period needed to be stored until Easter day, when they were blessed before being given to children. To honour the tradition, many of us paint eggs, or devour chocolate eggs (with surprise! ), or prepare a brunch with eggs as the main attraction. That’s the reason why this week I’m proposing five egg-based recipes that could be part of an Easter buffet or brunch. Originally published in the Journal de Montréal on April 19, 2014.